Greetings from the top of Australia! For the last 5 weeks Ocelot has been sailing up the Queensland coast, dodging the many motus and atolls of the Great Barrier Reef. Several folks have commented that they'd like to see where we are, so we've included Lat/Lon positions that the Internet-connected can plug into Google Earth to see satellite photos of where we've been. As of our last newsletter on 7 June we were enjoying visiting cruising friends from the 80's, Adrian and Suzette Pelt of Queensland Yacht Charters in Airlie Beach (S20°15.5' E148°42.4'). They loaned us a cute little Suzuki jeep to drive around so we re-provisioned, did wash, and got ourselves back and forth from their beautiful home in a lush tropical garden graced by wallabies and song birds. 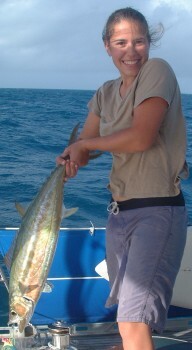 We were also able to share our huge Spanish Mackerel with them and their employees. We had many a wild ride at over 10 knots! We made an overnight sail from Airlie Beach to Townsville (S19°14.6' E146°49.6') where we spent the Queen's Birthday weekend with more sailing friends from the 1980's. Amanda had fun doing teen things with Alison and Becky while Sue and Jon hung with Peter and Sandy and watched some good dinghy racing in the bay. Well rested, we took off for Cairns with Becky on board (she was between jobs and loves to sail). 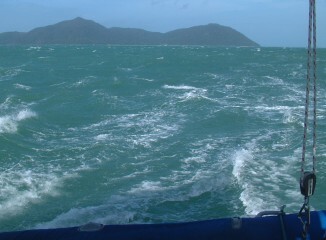 The winter SE winds were up so we had 3 days of rather exciting sailing in the shipping channel between the mainland and the Great Barrier Reef. Although the waters are "protected" by the reef, the swells were still big enough to have Ocelot surfing -- most days we averaged in excess of 8 knots(!) and often hit surfing speeds of 12-16 knots. We generally sailed with a reefed (reduced) mainsail out to one side and the jib out to the other (wing-and-wing). 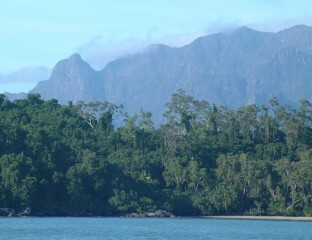 We would have liked to sail the 26 nautical miles (nm) of channel between Hinchinbrook's tall craggy mountains and the hills of the mainland, but there's a bar guarding the southern entrance which we passed at dead low tide, so there was no way to enter. Instead we sailed outside this magnificent island where we saw waves crashing on rocky shores and waterfalls cascading from the heights. After a 72nm day we tucked into the bay at the north of Hinchinbrook Island (S18°14' E146°15') off a tropical sandy beach and under the mountains. Gorgeous! After another 42nm of fast, downwind sailing we found haven at Mourilyan Harbor (S17°36.4' E146°07.5') a surprising touch of humanity in the middle of nowhere. The harbor is dredged for use by freighters that carry raw sugar and has room for a few boats over the shallow mud flats near mangroves. There we met Kindara, a Chinese/English family (kids 9 and 6) on a racy catamaran who will be sailing to Thailand on the Darwin-Indonesia Rally with us. On our third day with Becky we finally had lots of sun to accompany us as we surfed the swells, still heading northwest in front of the strong SE tradewinds along the Queensland coast. After 60nm we arrived in Cairns harbor and dropped the hook in the river (S16°55.2' E145°47.1') in time to get Becky to a 6pm bus back to Townsville. Having done all the touristy things around Cairns on our visit in 2000 we decided to take a nice walk around town and push on the next day. We made contact in Cairns with some other yachties who are Darwin-bound so now we don't feel like we're at the end of the pack anymore! We sailed hard for the next three days, covering about 150nm and stopping for just one night each at Low Islets (S16°22.9' E145°33.8') and Hope Island (S15°43.7' E145°27.4'). These Marine Park islands have free moorings which we were grateful to pick up because it's always easier to drop a mooring at 6:30 AM than to haul up the anchor when we plan a "first light" departure. At both Low and Hope Islands we dinghied ashore, to circum-perambulate the islands before sunset (takes about 10 minutes!) happy to get our feet into the sand. It was a bit of a shock to read the Warning! Achtung! sign about Hope Island being visited by crocodiles. It warned against swimming, but allowed spear fishing, which sounded odd. We were happy to see NO signs of these huge reptiles. A 9-hour, 72nm sail, past many small islands and dodging several big freighters, brought us to Lizard Island (S14°39.8' E145°27.1'). 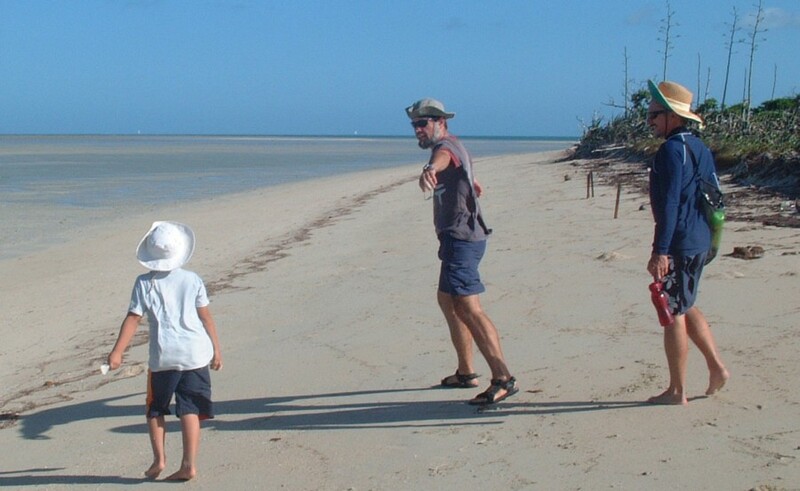 This national park is the farthest north resort island on the Queensland Coast and is a delightful touch of paradise after days of hard sailing. 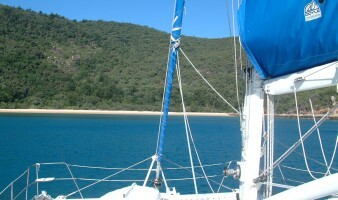 We anchored in 12' (4m) of light blue water over a clear sandy bottom. 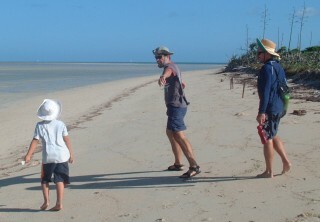 A few hundred yards ahead of us sat a long white sandy beach bordered by waving casuarina trees and hills with granite outcroppings. Atop 1000' (300m) high "Cook's Look" we could see the mainland, the other islands in this group, the gorgeous reef-lined lagoon on the far side of Lizard Island, and the Great Barrier Reef, some 12nm (20km) to the east. On the delightful coral reef just behind us sat many 4' (1.5m) long giant clams, their mantles colored green, blue or brown with colorful stripes or spots. Schools of reef fish swam in and around the soft corals that bloom in the sun, blue-spotted stingrays hid in the sand, and the occasional white-tip or black-tip reef shark patrolled the area just to keep our heartbeats going. We stayed at Lizard 4 days, enjoying the walks, snorkeling, underwater photography, and socializing with the other cruising yachts each evening on the beach, watching the green flash sunsets. From Lizard we made a long, 85nm (140km) day-sail to the Flinders Group of islands (S14°10.6' E144°13.8') averaging 8 knots all day and catching 2 fish before 10am. Thank goodness for electronic navigation as we were constantly dodging around reefs. 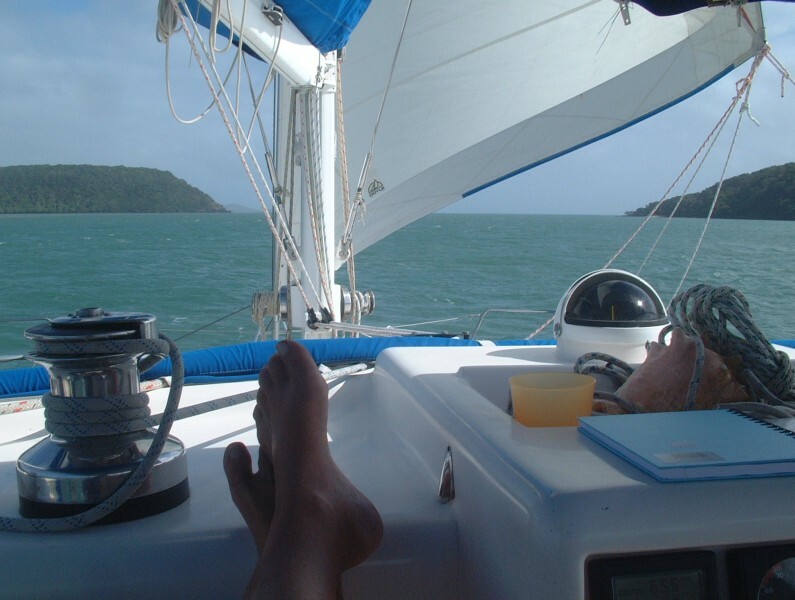 This was a long sail with about 8 sail changes and gusts of 40 knots around Cape Melville, but since we had the fish we found ourselves hosting 13 other people for dinner that night! From Morris we continued weaving about 65nm through the inner Great Barrier Reef to Portland Roads (S12°35.6' E143°24.5'), pushed by fairly constant 25 knots from the SSE. This strong-downwind sailing is delightfully flat and Ocelot can really stretch her legs. After another 41nm sail we shot through a narrow gap between islands to arrive (ahead of all the monohulls) in Margaret Bay (S11°57.6' E143°12.4'). The bay was so protected that we decided to take a day to relax in this delightful anchorage. Jon hiked with Kindara over to the far side of the point to go fossicking through all the junk blown up on the windward side. On the way he met some of the local lobstermen who offered to sell the fleet lobsters for US$2/lb ($4/Kg)! Such a deal! We topped up the freezer with huge, fresh lobster tails. The next day Jon harvested oysters off the rocks and Amanda battered them lightly for yet another glorious fresh seafood meal. 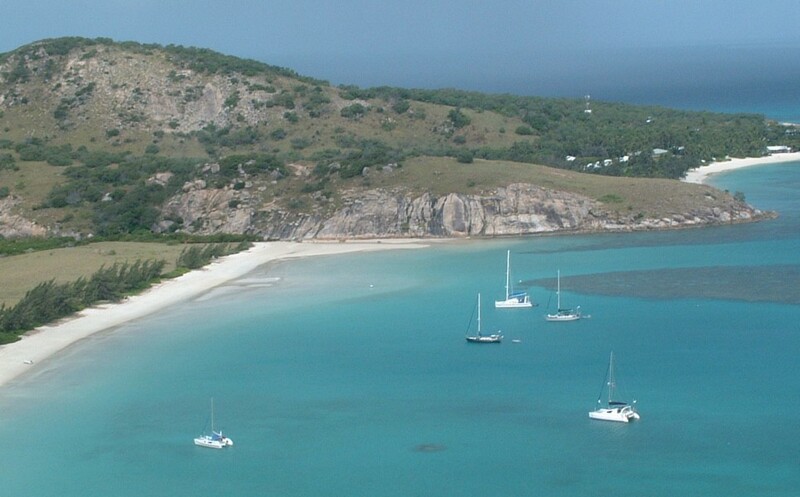 The monohull fleet decided to sail overnight to round Cape York, the northeastern-most point of Queensland, but we don't sail in these reef-infested waters at night if we can help it, even though we have better electronic navigation than most boats. Instead, after another blessed night in a flat anchorage we sailed 71nm with 2 other catamarans up to Escape River (S10°58' E142°41') a big pearl farming area with supposedly lots of crocs and other wildlife. We saw several wild crocs in 2000 but weren't in a hurry to see them again. wing-and-wing to the top of Australia. Today we sailed through beautiful Albany Passage (S10°44' E142°35.6') to round Cape York, the northernmost point of mainland Australia. Once we entered the passage we had flat seas, 25-30 knots of wind, and a 2-knot assist from the current so we made excellent time, often sailing along at a sustained 10 knots to the western side of the York Peninsula. We're now anchored off the outpost of Seisia (S10°51' E142°22') with several other cruisers, waiting for the winds to drop a bit before crossing the notoriously rough "washing machine" of the Gulf of Carpentaria. 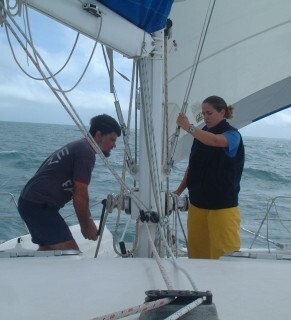 We've now sailed over 1,300nm since leaving Mooloolaba (S26°40.6' E153°08.4', just north of Brisbane) 5 weeks ago. We still have over 700nm to sail to Darwin, but there's little in the way so we'll do that as a passage, with a possible stop in the Wessel Islands if we want a breather. Although the rally events start on 14 July we want to get there a bit early so we can rent a car and explore the area a bit. Stay tuned for the further adventures of the good ship Ocelot as we continue sailing the shores of this really big island called Australia.